"Modern Family" -- the 2-year-old ABC mockumentary that anyone with a few complicated family relationships can relate to -- was the undisputed big winner at the 2011 Emmys, taking five awards Sunday night, including best comedy for the second year in a row. It also garnered awards for best supporting actress, best supporting actor, best director and best writing in the comedy category. Fan favorite "Mad Men" took home only one major award, but it was a biggie -- Best Drama, the show's fourth such accolade. On a generally feel-good night, with "Glee's" Jane Lynch acting as master of ceremonies, the 63rd annual Emmy awards had its share of laughs, emotional moments, and, thankfully, a shortage of groan-inducing skits that seem to plague awards shows these days. Topping the list of heart-warming moments were two key awards for "Friday Night Lights," which splits its time between NBC and a DirectTV channel for its final season. 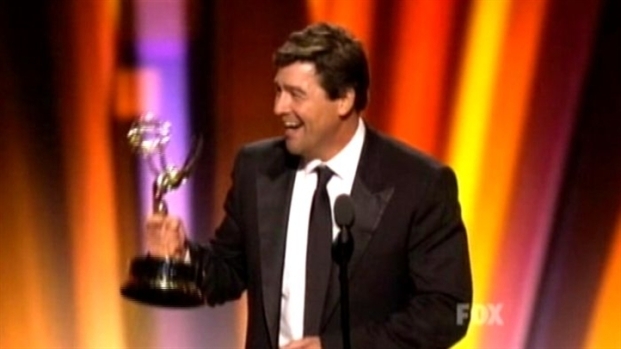 Kyle Chandler won for best lead actor in a drama and Jason Katims for best writing in a drama. Julianna Margulies won best actress in a drama for "The Good Wife," her second Emmy. And big-screen star Kate Winslett was overwhelmed with excitement as she accepted the award for best actress in a miniseries for her star turn in HBO's "Mildred Pierce." She thanked her "mum," a sweet sentiment that was only matched by "Game of Thrones" star Peter Dinklage (best supporting actor in a drama) who thanked his dog-walker. But it was the ebullient cast of "Modern Family" who were the darlings of the night. They brought their low-key charm to the stage in their acceptance speeches. Julie Bowen, who took best supporting actress, happily joked she'd have nothing to talk about in therapy now, while best supporting actor Ty Burrell said his late father would be proud of him but still wouldn't get why he wore makeup to work everyday. Their night was capped off in fine form when show creator Steven Levitan accepted the best comedy award by praising the show's willingness to tackle controversial relationships. "There's nothing wrong with a loving, committed relationship between an old man and a hot young woman," he joked. 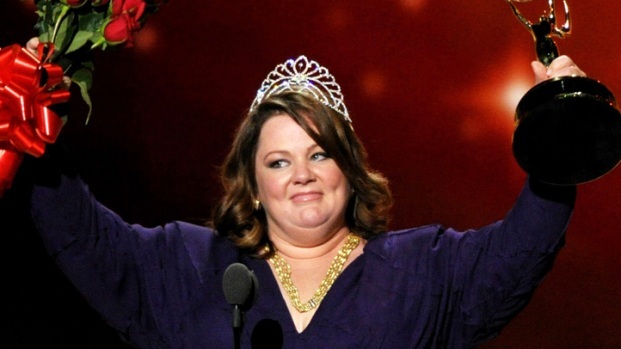 From a different family show, Melissa McCarthy won best actress in a comedy series for her work on CBS's "Mike and Molly," beating out favorites such as "30 Rock's" Tina Fey and "Parks and Recreation's" Amy Poehler. It was her first nomination and a bizarre one in which all the nominees came up on stage and a winner was literally crowned, pageant-style. "Holy smokes!" she yelled, clutcing her scepter and bouquet of red roses. Then it was Charlie Sheen's big moment, one that very nearly didn't happen. The mercurial star, who came out to present Outstanding Lead Actor in a Comedy, played it straight, graciously offering his former colleagues good wishes. "Thank you. Good evening. Thank you, thank you. Before I present Outstanding Lead Performance in a Comedy Series, Actor, my old category, I want to take a moment to get something off my chest and say a few words to everybody here from "Two and a Half Men." From the bottom of my heart, I wish you nothing but the best for this upcoming season. We spent 8 wonderful years together, and I know you will continue to make great television." It wasn't the hoped-for water cooler moment, but it was the right thing to do. Ashton Kutcher, Sheen's replacement, showed up later to present alongside new co-star John Cryer and made a joke about Cryer being a "troll." All of the awards came after a grand opening in which Jane Lynch danced her way though several TV shows via the miracle of modern editing, and ended up on stage in a production number that earned her a standing ovation and a confession from her about wearing "triple Spanx" as she hitched up her undergarments. Throughout the show, "The Emmytones" provided some strange choral transitions, but the rap performance featuring everyone from Andy Samberg, Akon and Michael Bolton (yes, the Michael Bolton) was weirdly wonderful. As awards shows go, it made for pretty entertaining television.